Arts Teachers work mostly in school and community establishments and instruct students on the basic concepts of Arts and Art history. 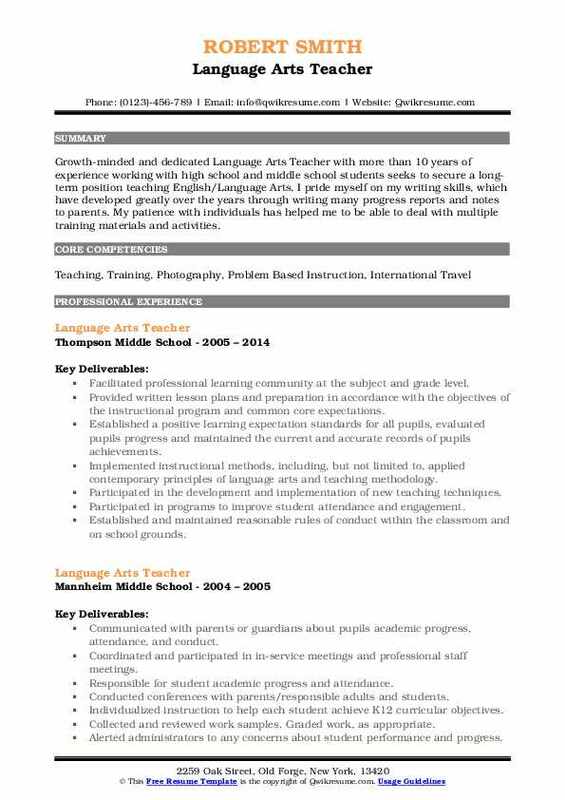 The most prominent duties that are highlighted on the Arts Teacher Resume are – supervising and assisting students in Arts subject, grading artwork, encouraging creativity, teaching various mediums and techniques, focusing on didactic instructions, teaching skills in art including drawing, lettering, art history and painting; planning and presenting art displays, making students understand the versatility of acrylic paints and teaching modern art principles. The minimum skills expected from the Arts Teacher include – a thorough knowledge of art history and various art genres, the ability to communicate well and abstract concepts to students and the potential to spot or cultivate creativity among students. Even though formal education is not needed for teaching at community establishments, a Bachelor’s degree in Arts is considered ideal for this role. 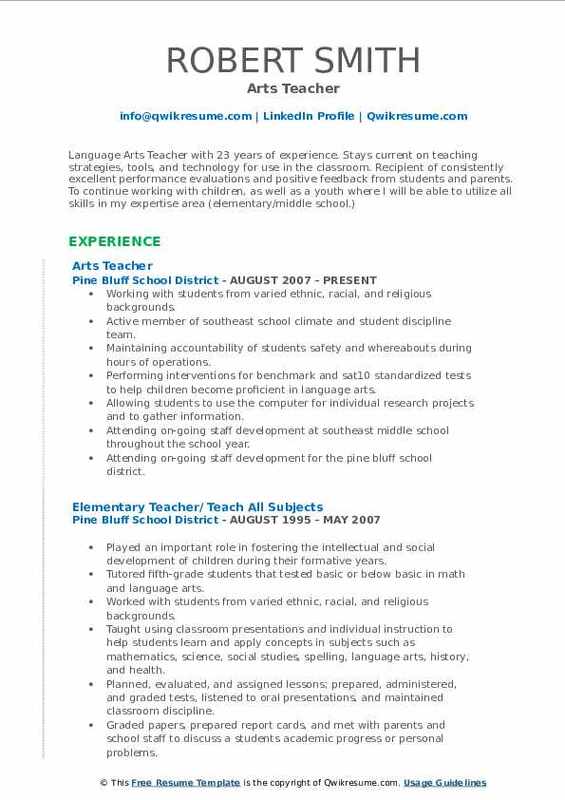 Summary : Accomplished education professional and Language Arts Teacher I with 11 years experience teaching and training in an online or blended learning environment. Offer exceptional organizational skills. Proven success in project management and team leadership, diverse technology experience, excellent written and verbal communication, and the ability to work autonomously. Developed units and lessons aligned with common core standards for 7th and 8th-grade students in language arts and communication skills in class sizes (20-33). Constructed and implemented lesson plans, employing diverse teaching strategies to effectively address each student. Provided instruction in current research and practice concerning literacy acquisition that includes: shared, guided, independent reading, small group literacy strategy lessons, vocabulary instruction, writers workshop, and engaging. Balanced teaching methodology integrated with the Danielson framework and common core standards. Implemented and monitored ongoing formal and informal student learning assessments. Piloted grade level writing assessments using developed P.A.R.C.C. Rubric. Effectively utilized positive interaction with students, developing a rapport, gaining respect, and trust to ensure an environment that is conducive to learning. 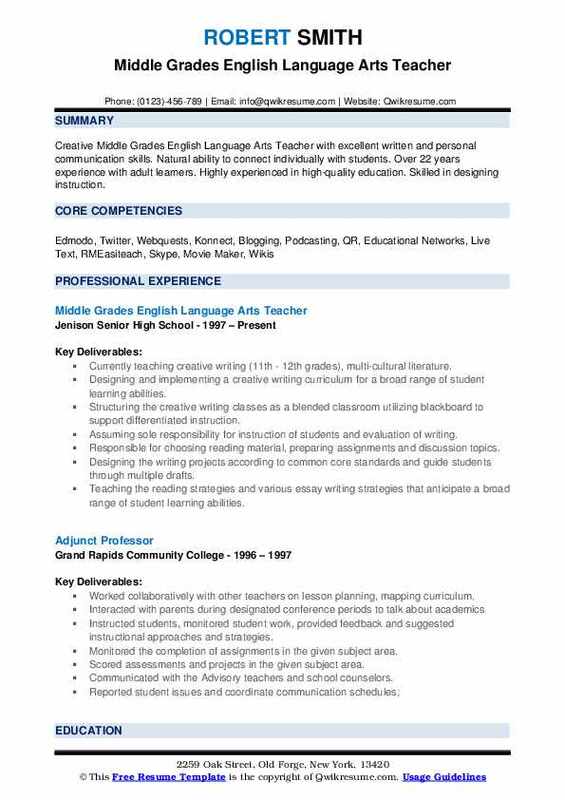 Summary : Creative Middle Grades English Language Arts Teacher with excellent written and personal communication skills. Natural ability to connect individually with students. Over 22 years experience with adult learners. Highly experienced in high-quality education. Skilled in designing instruction. Currently teaching creative writing (11th - 12th grades), multi-cultural literature. Designing and implementing a creative writing curriculum for a broad range of student learning abilities. Structuring the creative writing classes as a blended classroom utilizing blackboard to support differentiated instruction. Assuming sole responsibility for instruction of students and evaluation of writing. Responsible for choosing reading material, preparing assignments and discussion topics. Designing the writing projects according to common core standards and guide students through multiple drafts. Teaching the reading strategies and various essay writing strategies that anticipate a broad range of student learning abilities. Lesson plans typically revolve around reading novels, short stories, essays and other forms of literature, and requires students to analyze, interpret and dissect written material in order to compare, contrast and discuss elements, like the theme, characters and plot. 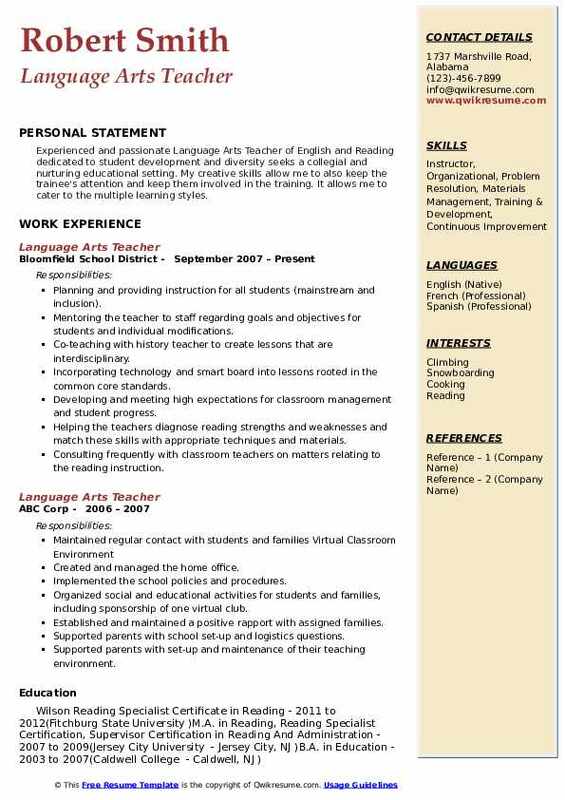 Summary : Passionate and highly experienced Language Arts teacher with a history of undertaking positions of responsibility within department and school in addition to maintaining high standards of excellence in the classroom. Able to teach literature, grammar, composition, technical writing, and research paper development at the college level. 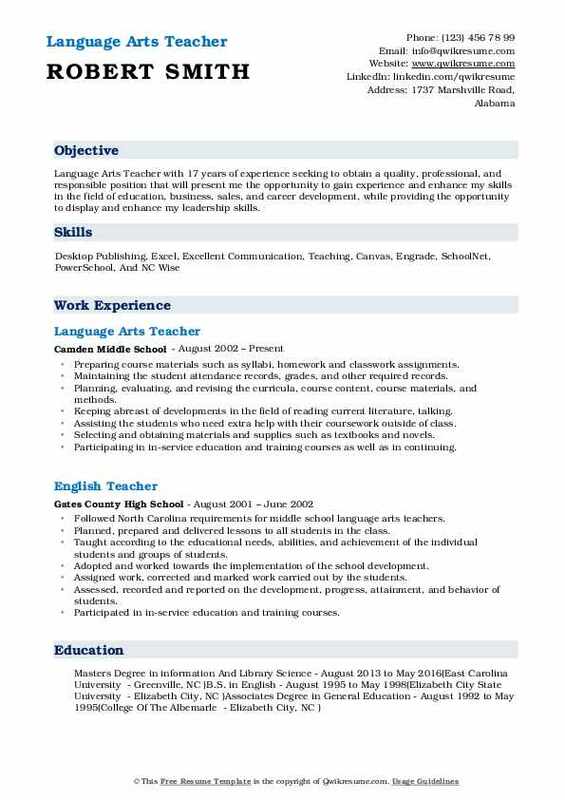 Teaches high school language arts, reading comprehension, writing, test preparation, and public speaking. Taught 9th, 10th, and 12th grades, including inclusion and honors-level curriculum. Instructed up to five classes daily, of up to 33 students each, with multiple preps per day. Participated on a team that developed 9th-grade curriculum, restructured 12th-grade curriculum map upon selection of new textbook. Used technology such as smart boards, airliners, iPods, and video cameras in the class. Utilized fusion districtwide software for Wiki and Blogging. Included activities that appealed to students with various learning styles. Blocked-scheduled classes included several activities such as collaborative learning, discussion, and presentation. Required students to upload assignments via district website and google docs. Posted grades online for parents. Assigned book reports involving electronic presentations, collaborative essays using google docs, and various presentations involving choice of written report, video, or performance to conclude the project. Working with students from varied ethnic, racial, and religious backgrounds. Active member of southeast school climate and student discipline team. Maintaining accountability of students safety and whereabouts during hours of operations. Performing interventions for benchmark and sat10 standardized tests to help children become proficient in language arts. Allowing students to use the computer for individual research projects and to gather information. Attending on-going staff development at southeast middle school throughout the school year. Attending on-going staff development for the pine bluff school district. Planning, evaluating, and assigning the lessons, preparing, administering, and grading the tests. Summary : A reliable, friendly, and autonomous Language Arts Teacher, who quickly learns and masters new concepts and skills with flexibility. Many years of experience in the education domain. 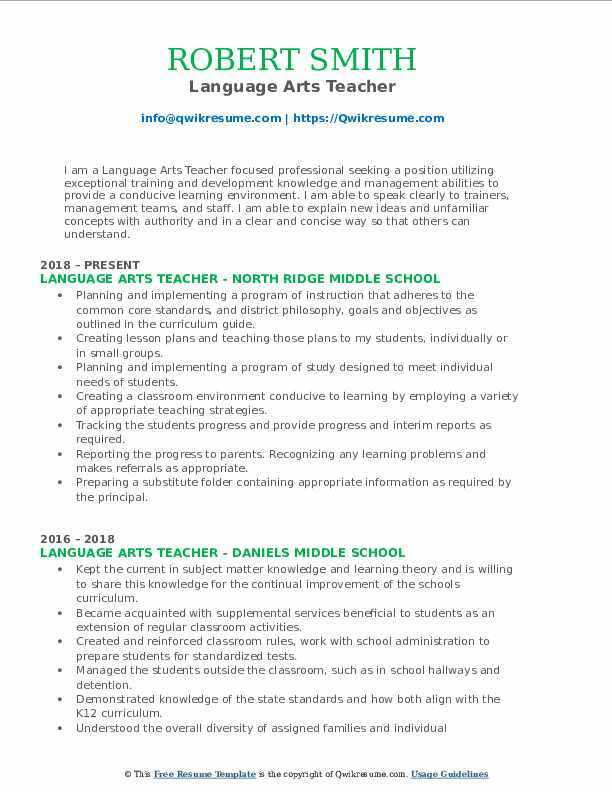 Seeking a position allowing me to utilize my coaching, mentoring, teaching, and leadership skills. Attending professional meetings, educational conferences, and teacher training workshops to maintain and improve professional competence. Establishing clear objectives for all lessons, units, and projects and communicate those. Planning and conducting activities for a balanced program of instruction, demonstration, and work time that provides students with opportunities to observe, question, and investigate. Providing the disabled students with assistive devices, supportive technology, and assistance. Collaborating with other teachers and administrators in the development, evaluation, and revision of secondary school programs. Observing and evaluating the student's performance, behavior, social development, and physical. 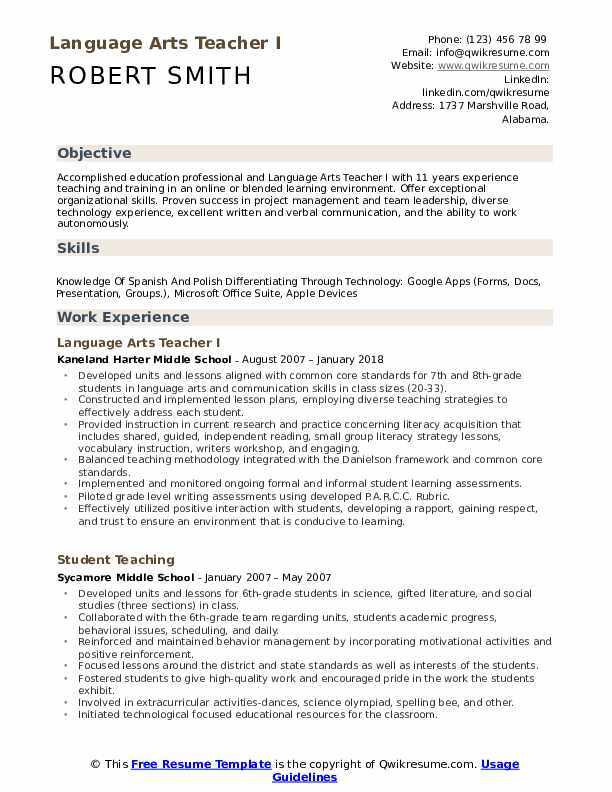 Summary : Language Arts Teacher with 17 years of experience seeking to obtain a quality, professional, and responsible position that will present me the opportunity to gain experience and enhance my skills in the field of education, business, sales, and career development, while providing the opportunity to display and enhance my leadership skills. Preparing course materials such as syllabi, homework and classwork assignments. Maintaining the student attendance records, grades, and other required records. Planning, evaluating, and revising the curricula, course content, course materials, and methods. Keeping abreast of developments in the field of reading current literature, talking. Assisting the students who need extra help with their coursework outside of class. Selecting and obtaining materials and supplies such as textbooks and novels. Participating in in-service education and training courses as well as in continuing. Communicating, consulting and co-operating with other members of the school staff, including those having posts of special responsibility and parents/guardians. Maintaining good order and discipline amongst students under ones care and safeguarding their health and safety at all times. Objective : I am a Language Arts Teacher focused professional seeking a position utilizing exceptional training and development knowledge and management abilities to provide a conducive learning environment. I am able to speak clearly to trainers, management teams, and staff. I am able to explain new ideas and unfamiliar concepts with authority and in a clear and concise way so that others can understand. Planning and implementing a program of instruction that adheres to the common core standards, and district philosophy, goals and objectives as outlined in the curriculum guide. Creating lesson plans and teaching those plans to my students, individually or in small groups. Planning and implementing a program of study designed to meet individual needs of students. Creating a classroom environment conducive to learning by employing a variety of appropriate teaching strategies. Tracking the students progress and provide progress and interim reports as required. Reporting the progress to parents. Recognizing any learning problems and makes referrals as appropriate. Preparing a substitute folder containing appropriate information as required by the principal. Planning and prescribing purposeful assignments for paraprofessionals, tutors, and volunteers as needed. 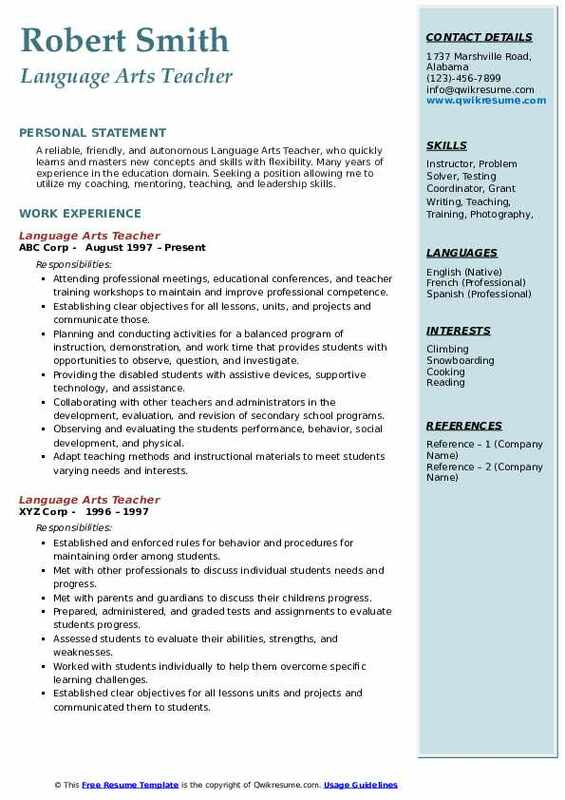 Summary : Growth-minded and dedicated Language Arts Teacher with more than 10 years of experience working with high school and middle school students seeks to secure a long-term position teaching English/Language Arts. I pride myself on my writing skills, which have developed greatly over the years through writing many progress reports and notes to parents. My patience with individuals has helped me to be able to deal with multiple training materials and activities. Facilitated professional learning community at the subject and grade level. Provided written lesson plans and preparation in accordance with the objectives of the instructional program and common core expectations. Established a positive learning expectation standards for all pupils, evaluated pupils progress and maintained the current and accurate records of pupils achievements. Implemented instructional methods, including, but not limited to, applied contemporary principles of language arts and teaching methodology. Participated in the development and implementation of new teaching techniques. Participated in programs to improve student attendance and engagement. Established and maintained reasonable rules of conduct within the classroom and on school grounds. Initiated appropriate conferences with parents, guardians, administrators, and/or ancillary personnel, in accordance with school procedures. Summary : Experienced and passionate Language Arts Teacher of English and Reading dedicated to student development and diversity seeks a collegial and nurturing educational setting. My creative skills allow me to also keep the trainee's attention and keep them involved in the training. It allows me to cater to the multiple learning styles. Planning and providing instruction for all students (mainstream and inclusion). Mentoring the teacher to staff regarding goals and objectives for students and individual modifications. Co-teaching with history teacher to create lessons that are interdisciplinary. Incorporating technology and smart board into lessons rooted in the common core standards. Developing and meeting high expectations for classroom management and student progress. Helping the teachers diagnose reading strengths and weaknesses and match these skills with appropriate techniques and materials. Consulting frequently with classroom teachers on matters relating to the reading instruction. Working with support staff and school administrators to facilitate the coordination of the reading program with the total curriculum. 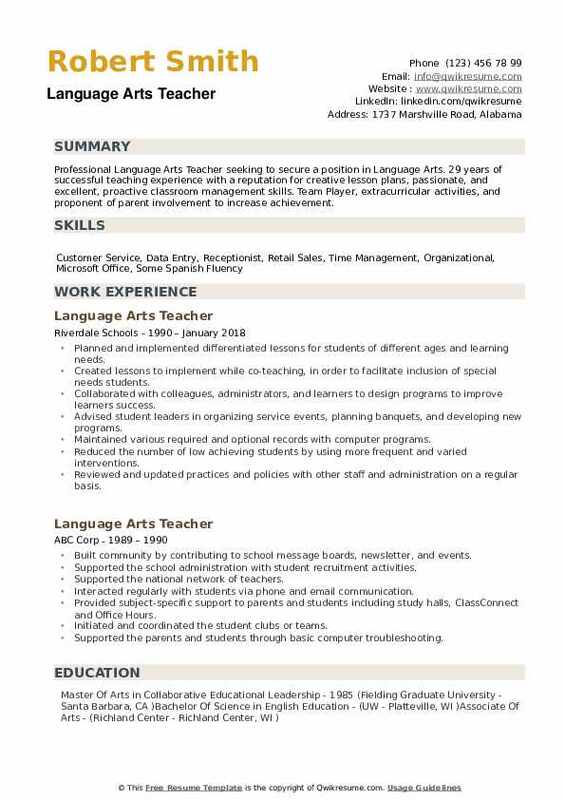 Summary : Professional Language Arts Teacher seeking to secure a position in Language Arts. 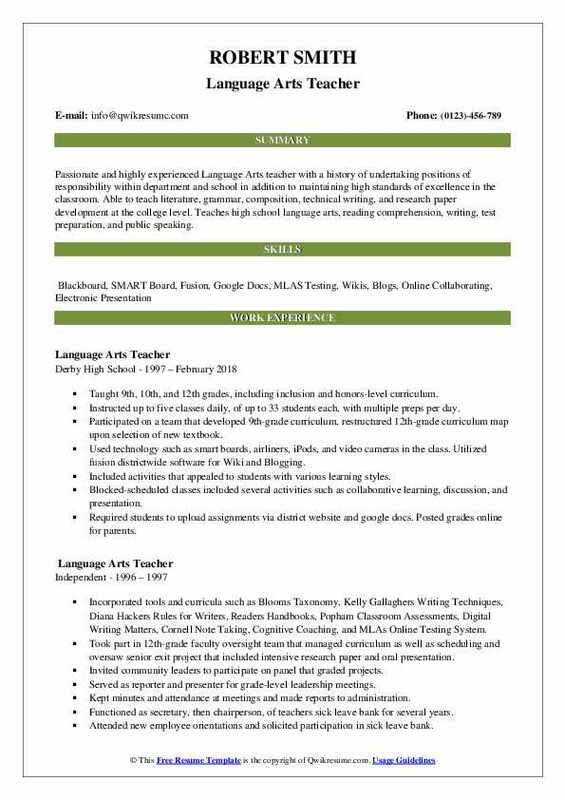 29 years of successful teaching experience with a reputation for creative lesson plans, passionate, and excellent, proactive classroom management skills. Team Player, extracurricular activities, and proponent of parent involvement to increase achievement. Planned and implemented differentiated lessons for students of different ages and learning needs. Created lessons to implement while co-teaching, in order to facilitate inclusion of special needs students. Collaborated with colleagues, administrators, and learners to design programs to improve learners success. Advised student leaders in organizing service events, planning banquets, and developing new programs. Maintained various required and optional records with computer programs. Reduced the number of low achieving students by using more frequent and varied interventions. Reviewed and updated practices and policies with other staff and administration on a regular basis. Attended conferences and seminars to continually update skills and to maintain knowledge of college, community and business leaders needs. Maintained daily confidential records and completed annual inventory and budgeting processes. Additional activities include forensics coach, class advisor, national honor society faculty council and advisor, scholarship committee member, faculty goals committee member, district liaison committee member, strategic planning sub-committee member, in-service committee member, each committee member, nominations committee chair.